David Horowitz is one of the rare human beings, and handful of former Sixties radicals, who made an unequivocal break with his longstanding political beliefs and commitments. Unlike many former radicals who renounced some of the questionable means used in the pursuit of their political agenda but refused to distance themselves from the purported ideals, Horowitz rejected the ideals as well. In the meantime, most of the former Sixties radicals, or even some Sixties moderates, have continued to cling nostalgically to what they consider to be admirable goals embedded in their youthful idealism and legitimated by the irresistible appeal of good intentions. Horowitz can claim further distinction on account of being an exceptionally knowledgeable guide to all varieties of the American left and his understanding of these movements and the mentalities of their adherents. It helps that he has been familiar with many individuals representing or associated with the same movements. Also unusual, even among the fully disillusioned, that ever since his break with his political past, Horowitz has devoted his life to renouncing and combating his former political illusions, commitments and affiliations. In doing so he was willing to risk the over-politicization of his own life, and the weakening of the boundaries between the personal and the political realm. He has also made it easier for his many critics to claim that his crusading spirit bears some resemblance to those of his former comrades and adversaries. Horowitz was capable of distancing himself from the sustaining embrace of discredited beliefs provided by the surviving subcultures of the Sixties and he paid (I presume) both an emotional and more tangible price for doing so. Many of his former radical colleagues have never forgiven his rejection of their animating beliefs and source of identity. His unembarrassed renunciation of sacrosanct political beliefs — at once liberating and wrenching — has also reduced, or more likely eliminated, many employment opportunities especially in the academic world. At last, it is always difficult, under any circumstances, to fundamentally alter or discard strongly held beliefs and causes which made one’s life meaningful and used to be a major source of one’s sense of identity. Hobsbawm’s case is all the more noteworthy since unlike many other leftist sympathizers with the Soviet system he was well aware of its resounding failure to realize its founding ideals. He nonetheless admitted that in spite of all he knew, “‘To this day I notice myself treating the memory and tradition of the USSR with an indulgence and tenderness.’”  George Lukacs, the Hungarian Marxist philosopher, provides a similar example of a distinguished intellectual, thoroughly familiar with the failures and moral atrocities of the Soviet system, who nonetheless harbored a lifelong bond of affection for it that he was unable to sever. Another major theme of these writings is the continuity between the Old and the New Left, and their defining beliefs. Horowitz argues that “by the end of the decade [of the sixties] the ‘new’ left had become indistinguishable from the old…”  This is an overstatement. Doubtless, both movements shared an unqualified rejection of their own society and detestation of capitalism, as well as sympathy for any state or movement that denounced or challenged their society and capitalism. However, there have also been notable and significant differences. For one thing, the New Left lost interest in the Soviet system and was (mildly) critical of it. It embraced a romantic rejection of modernity (not just capitalism) and a contradictory mix of a self-indulgent individualism and — what it considered — nurturing collectivism. Unlike the beliefs and institutional arrangements favored by the Old Left, there was no trace of puritanism in the New. The radical left of the Sixties shared with Georges Bataile, the French philosopher, a “longing for community and his glorification of transgression – acts of excess that would disrupt the status quo.” 2 Nor was the New Left organizationally linked to any existing communist state or organization, unlike its predecessor that was tied to the Communist Party of the U.S. and its front organizations. Horowitz also makes the point that the terms “left” and “liberal” have become indistinguishable as the New Left came to usurp the liberal designation wishing to discard the “left” appellation that the failed communist systems brought into disrepute. The problem with this argument is that the left is not monolithic (as Horowitz well knows) and there has always been a moderate, anti-communist left, including social-democrats, that can justifiably claim the liberal mantle and not only as a public relations camouflage. Reading these essays I often felt that whenever critical reference was made to the left it was the radical left Horowitz had in mind. It is indisputable that, as Horowitz writes, “for 40 years Noam Chomsky has turned out book after book, pamphlet after pamphlet, and speech after speech with one message…alone: America is the Great Satan, the fount of evil in this world.” [223-224] At the same time it is hard to determine whether or not Chomsky has actually radicalized his audiences, or his popularity reflects an already existing predisposition and receptivity to his messages. It should also be noted that he has been subjected to criticism by some moderate leftists and liberals as well. The popularity of Oliver Stone’s movies, abounding in absurd conspiratorial scenarios and ascribing a wide variety of evil to the United States are also among the symptoms of malaise enumerated by Horowitz. Not surprisingly, his latest movie called “My Friend Hugo” glorifies the late Chavez of Venezuela. The same underlying disposition also found expression in the recent support for political systems such as Venezuela under Chavez, the implacable hostility towards Israel, and more generally, in giving the benefit of the doubt to any social-political movement that has recycled some Marxist ideals and rejects capitalism, and its alleged bulwark, the United States, holding it responsible for every global economic, social or political problem. Perhaps the most important, that many radical leftists continue to harbor the hope that there are political-institutional remedies and solutions for personal problems, that the discontents of modernity and the contradictory desires of human beings may one day be taken care of by political movements and systems which profess good intentions. I have some minor quibbles and disagreements to register. Mark Kramer is not one of the authors of the Black Books of Communism, as stated in a footnote on page 25. He was its translator. It is arguable that the Soviet Union was “the most oppressive and repulsive empire in human history.”  (My emphasis.) Was it worse than Mao’s China or Nazi Germany? “One of the most…” would have been a safer assertion. I would also hesitate to call socialism “a theory of economic theft,” or make other generalizations about it since there are considerable differences between the state socialism of the Soviet kind and the social democratic socialism that used to prevail in Scandinavian countries. I am dubious about the proposition that “leftwing intellectuals like Hitchens and Berman…still nourish an enthusiasm for the utopian chimera.”  In the first place I am not sure about the unqualified, present-tense attribution of “leftwing” to them (even as it applies to Hitchens before his death). I doubt even more strongly that of late (if ever) they harbored utopian and revolutionary longings. True enough, Hitchens, even after the shift in his political worldview, had a soft spot for Trotsky but otherwise made a decisive and public break with his own leftism. More generally I am inclined to disagree with the suggestion that Hitchens “never did leave the left”  or that he “retain[ed] his progressive bona fides.”  He was actually denounced and vilified by many of his erstwhile comrades-in-arms, as Horowitz notes elsewhere in the same volume. I knew Hitchens (though not well) and spoke to him several times about his political attitudes and evolution and wrote about him.3 That does not mean that I applaud all his political judgments and ideas (including his vehement and intolerant attacks on religion); nor do I consider myself an authority on his political convictions and transformations. I would also be reluctant to lump together, as Horowitz does, Hobsbawm, Chomsky, and Todd Gitlin as “Stalinist intellectuals” even if they shared (different degrees of) a revulsion of America. The three of them are different not only in their political outlook and rhetoric but professional accomplishments as well. Hobsbawm’s was a competent historian notwithstanding his deluded affection for the Soviet Union and his long membership in the British Communist Party. As far as I know his rhetoric never came close to the vilifications and demagoguery of Chomsky who abandoned his work as a linguist decades ago to specialize in the obsessive demonization of the United States and Israel. In turn, Gitlin considerably modified his devotion to Sixties radicalism and rejected a good deal of it. Calling all of them “Stalinist” unhappily reminds me of the misuse of “fascist” similarly used to definitively discredit. Another far-fetched assertion I came upon is that “deep in their hearts the radicals regarded the triumphs of the civil-rights movement as worrisome subversions of their real agendas”  which were “revolutionary.”  I don’t think that all, or most radicals necessarily subordinated the goals of the civil rights movement to their more far reaching “revolutionary” agendas. Notwithstanding the reservations expressed above this collection is an informative and authentic guide to the American radical left and some of its animating beliefs by an author who used to be a very vocal part of it. 1 David Brooks: “Putin Can’t Stop,” New York Times, March 4, 2014. 2 Richard Wolin: The Seduction of Unreason, Princeton NJ, 2004, p. 163. 3 See Paul Hollander: The End of Commitment: Intellectuals, Revolutionaries, and Political Morality, Chicago 2006. 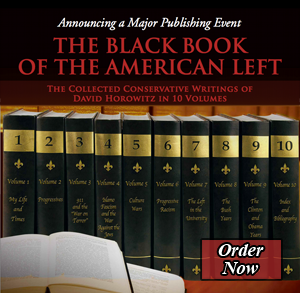 The same book also examined the political transformation of David Horowitz. I want to thank Paul Hollander for a thoughtful review of Volume II of The Black Book of the American Left: Progressives. Because it appears in a magazine I publish I am taking the liberty of responding to some of his critical points, mainly because if I do not they may be seized upon by my detractors on the left as observations I do not challenge. Let me say at the outset that many of the points which Hollander calls quibbles are differences of opinion about which the reader can easily form an opinion, and are not substantive in a way that concerns me. The first and most important of the claims that do concern me is Hollander’s suggestion that I lump together as “Stalinist intellectuals” Hobsbawm, Chomsky and Gitlin. In fact I do not. In the essay titled “The Mind of the Left,” which provides extended profiles of these three figures, I go out of my way to say that Gitlin is a sharp critic of Chomsky, while the section on Chomsky is headlined “The Nihilist Left,” of which Chomsky is the exemplar. Hollander’s mistake comes from an error that appears late in the text — several hundred pages after the aforementioned profiles — in a sentence referring to “The Mind of the Left,” which says that in it I “traced the continuities in radical thought from the generation of Stalinist intellectuals like Eric Hobsawm [to New Left intellectuals like] Noam Chomsky and Todd Gitlin.” The words in brackets were dropped from the published text but anyone reading “The Mind of the Left” would (or should) know exactly what I meant. Hollander says that he would hesitate to call socialism “a theory of economic theft” as I do. Why? What is economic redistribution but the taking of the earned fruits of one segment of the population and giving it to those who haven’t earned it? I wrote this as a riposte to the socialist claim that “property is theft.” Obviously property is the legal protection of individual freedom and the rights of the individual to the fruits of his labor. Which is why an economic theory to abolish property is a theory of economic theft. Hollander calls “far-fetched” my assertion that “deep in their hearts the radicals regarded the triumphs of the civil-rights movement as worrisome subversions of their real agendas.” As one of those radicals at the time, I know what I am talking about. The left turned its back on King after the passage of the Civil Rights Acts. Not a single New Left leader joined King’s last campaigns including the one in which he was killed. That is because the left did not want blacks to be integrated into the American system as King advocated. Instead the left supported racists (euphemistically referred to as “separatists”) like Stokeley Carmichael specifically for this reason. Far from my assertion being “far-fetched,” it is Hollander’s supposition that the left had good intentions that requires explanation. The whole post-King history of the civil rights movement which quickly degenerated into a racial assault on American values and in particular on the racial neutrality that was the core of King’s program is unintelligible if the left did not regard King’s message as troubling and seek to subvert it. On the matter of Hitchens, Hollander is entitled to his opinion that Christopher left the left but a simple survey of the crowd at his memorial and the speakers at the international tribute to him in a specially televised event from London would say otherwise. I knew Christopher a lot better than Hollander and I have written a long appreciation of him which set out to define his complex political persona in an essay not in this volume. It is called “The Two Christophers: Or the Importance of Second Thoughts.” Readers can find it in my archive on this website or in my book Radicals: A Destructive Passion. In closing I want to thank Paul Hollander for stimulating these thoughts and for providing an insightful review of my book. My comment on “lumping together” Chomsky, Gitlin and Hobsbawm was based on a sentence on page 312 of this book. I understand now that in an earlier essay David Horowitz made clear the differences among these three authors but the volume I reviewed did not include that essay. I certainly don’t believe that “property is theft,” nor do I believe that progressive income taxes are theft. Likewise I don’t believe — and I wonder if Horowitz does — that the right to the “earned fruits” of one’s labor is, or ought to be, unconditional. If so, no taxes could ever be collected. The difficult question is how far the state should, or could go to in its attempts to equalize opportunities, and reduce inequalities by the use of the revenues it collects (and redistributes) and by other means. I don’t believe that equality of condition can ever be accomplished and I am also well aware that zealous attempts to do so can have a wide range of undesirable side effects and unintended consequences (including the growth of coercive bureaucracies). But I also believe that extreme inequalities are morally and socially problematic and undesirable. It is not easy to reconcile these two positions. I am sure that David Horowitz correctly argues that elements of the radical left preferred the Black Panthers, Malcolm X or Stokely Carmichael to Martin Luther King and other moderate civil rights leaders. I took issue with what struck me as an over-generalization about the radical left’s “real agenda” that entailed a cynical devaluation of civil rights compelled by its far reaching revolutionary aspirations including separatism. Separatism, unwelcome as it is, does not necessarily conflict with the pursuit of civil rights. It is very likely that David Horowitz knew Hitchens far better than I and read some of his writings I did not, and therefore is in a better position to assess the extent and depth of his political transformations and the remaining bonds with his youthful commitments and allegiances. For example I don’t know (and would like to know) how Hitchens’ view of Israel evolved following, and associated with, his break with Edward Said. “A simple survey of the crowds” who attended Hitchens’ memorial service and the speeches made on the occasion are not necessarily reliable indicators of the nature, or durability of the political beliefs of Hitchens; their presence does not prove that their convictions and those of Hitchens late in his life converged. On the other hand, the volume, intensity and virulence of his denunciation by erstwhile comrades-in-arms (some of whom might have attended the same funeral) suggest that his “heretical” political positions and transformation were genuine and far-reaching. How much of his earlier political beliefs and attitudes Hitchens might have retained in ripe middle age is a matter that leaves room for speculation, disagreement and varied interpretations. Not to carry on this dialogue ad infinitum I will just address Paul’s objection to my statement that “socialism is theft.” Taxation to support community goods is not socialism in my book. Socialism is taxation designed to redistribute income, that is to take earned income from one element of the population and give it to another deemed deserving by whoever controls the state. And that is theft.